In this section, we will see how the search text will be highlighted in the data grid view cell where it matched. In this section, we will see how the search text is highlighted in the Data Grid View cell where it has matched. We will apply searching over selected columns of the grid. Suppose we have a search textbox and Data Grid View which is displaying the data. Whatever text we will write over the search text box, this text needs to search over the Data Grid View over specific columns and highlight the matched words over the grid cell with yellow color. Data Grid View and a text box. txtSearch_KeyUp - for getting the text for searching. dataGridViewForSearching_CellPainting - it is used to highlight the search text in the Data Grid View cell. frmHighlightSearchTextInDataGridView_Load- form load event to bind the grid. In the below screen, let's type “at” over search text box and it highlights the data over the grid. Add “data grid view” and “text box” control in the form. 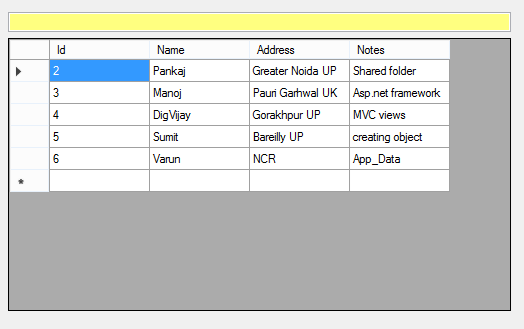 Create data table to bind with the Data Grid View. // Here we add 5 DataRows. Bind theData Grid View with table on the form load event. 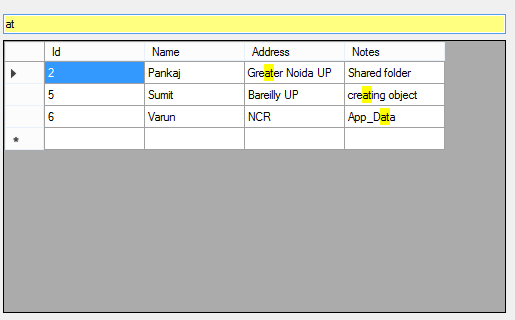 Create function SearchDataInDataGridViewOverSelectedFields() for filter or search the searching text into data table which are used to bind the Data Grid View. // Apply search over selective fields. In the above function, we used RowFilter to filter the data from data table by applying over selective fields. Use txtSearch_KeyUp event to get the searching text as input from user. Now, so far, if we run the application, it will filter the data of the data grid on the basis of search textbox data, but it will not highlight the matched text. So, for achieving this highlighted cell content, we will use cellPainting event ofData Grid View. Use dataGridViewForSearching_CellPainting() for paint the match text in grid cell with the background yellow color. // High light and searching apply over selective fields of grid. // check the index of search text into grid cell. //find the size of the text before the search word in grid cell data.